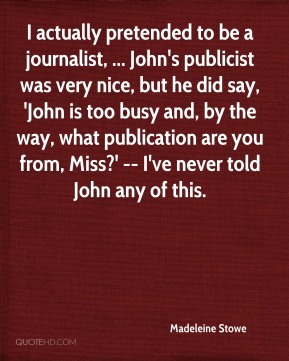 I actually pretended to be a journalist, ... John's publicist was very nice, but he did say, 'John is too busy and, by the way, what publication are you from, Miss?' -- I've never told John any of this. 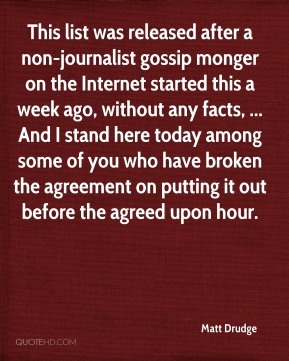 This list was released after a non-journalist gossip monger on the Internet started this a week ago, without any facts, ... And I stand here today among some of you who have broken the agreement on putting it out before the agreed upon hour. 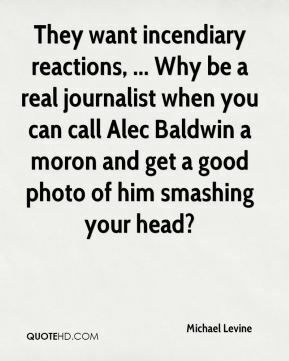 They want incendiary reactions, ... Why be a real journalist when you can call Alec Baldwin a moron and get a good photo of him smashing your head? 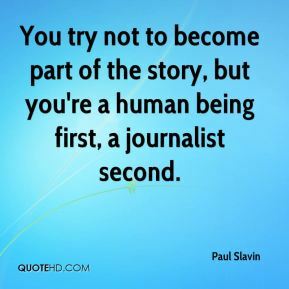 You try not to become part of the story, but you're a human being first, a journalist second. 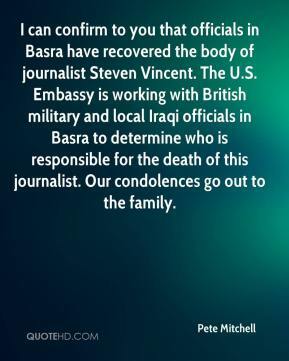 I can confirm to you that officials in Basra have recovered the body of journalist Steven Vincent. 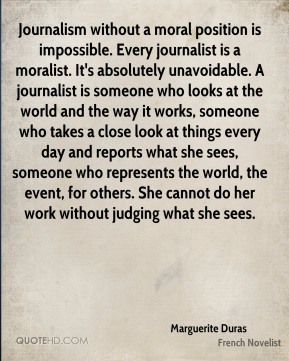 The U.S. Embassy is working with British military and local Iraqi officials in Basra to determine who is responsible for the death of this journalist. Our condolences go out to the family. 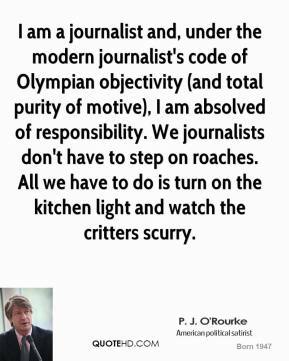 Paul was an excellent journalist and excellent educator, and he did a great job of combining those two areas in the Native Media Center. 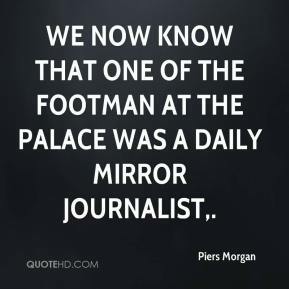 We now know that one of the footman at the palace was a Daily Mirror journalist. 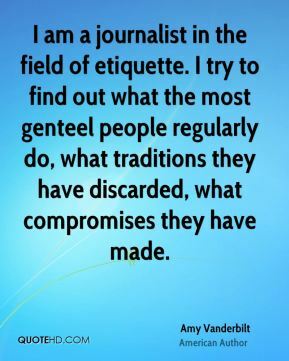 I'm a cultural historian, not just a journalist, ... I feel with these 'Little-Known Museums' you really get a sense of the people through it. I decide who I'm going to give these bags to, ... Madison & Mulholland has credibility because I was a journalist for 22 years, and I think I'm able to say who's hot and who I would give these products to. 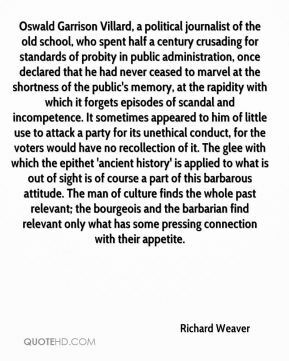 Oswald Garrison Villard, a political journalist of the old school, who spent half a century crusading for standards of probity in public administration, once declared that he had never ceased to marvel at the shortness of the public's memory, at the rapidity with which it forgets episodes of scandal and incompetence. 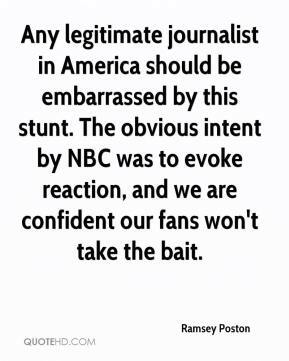 It sometimes appeared to him of little use to attack a party for its unethical conduct, for the voters would have no recollection of it. 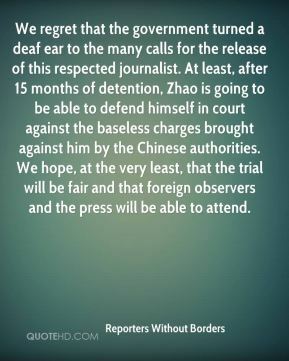 The glee with which the epithet 'ancient history' is applied to what is out of sight is of course a part of this barbarous attitude. 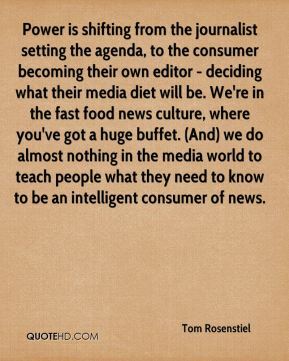 The man of culture finds the whole past relevant; the bourgeois and the barbarian find relevant only what has some pressing connection with their appetite. 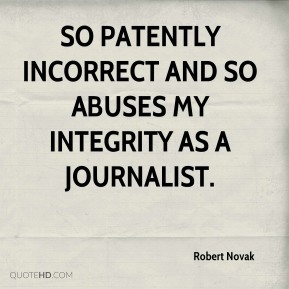 so patently incorrect and so abuses my integrity as a journalist. 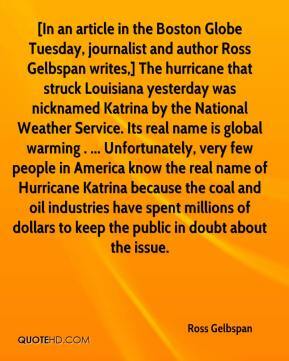 [In an article in the Boston Globe Tuesday, journalist and author Ross Gelbspan writes,] The hurricane that struck Louisiana yesterday was nicknamed Katrina by the National Weather Service. Its real name is global warming . ... Unfortunately, very few people in America know the real name of Hurricane Katrina because the coal and oil industries have spent millions of dollars to keep the public in doubt about the issue. 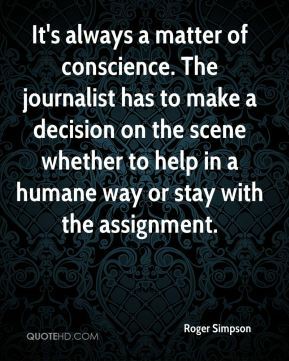 It's always a matter of conscience. 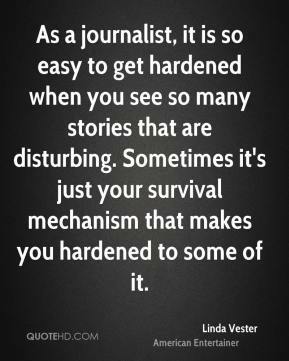 The journalist has to make a decision on the scene whether to help in a humane way or stay with the assignment. 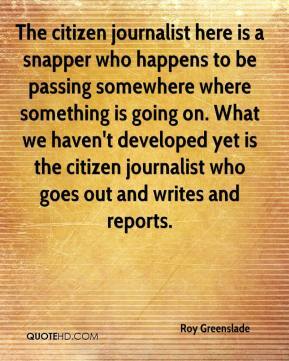 The citizen journalist here is a snapper who happens to be passing somewhere where something is going on. 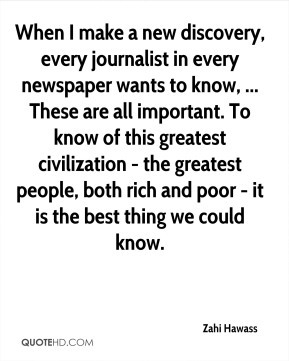 What we haven't developed yet is the citizen journalist who goes out and writes and reports. 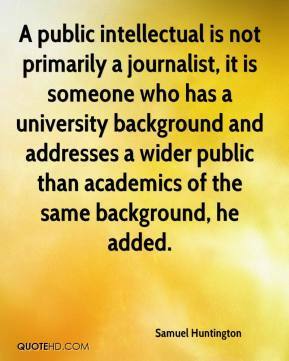 A public intellectual is not primarily a journalist, it is someone who has a university background and addresses a wider public than academics of the same background, he added. 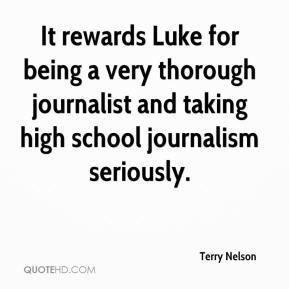 It rewards Luke for being a very thorough journalist and taking high school journalism seriously. 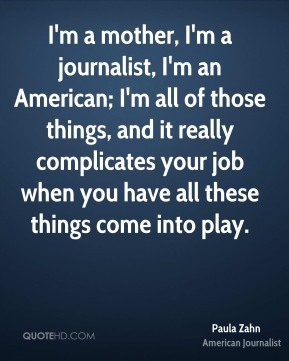 I'm a mother, I'm a journalist, I'm an American; I'm all of those things, and it really complicates your job when you have all these things come into play.